Andrea Rosen Gallery is thrilled to announce a highly unique exhibition that joins in conversation works by Jacob Kassay, Olivier Mosset and Lawrence Weiner. Presented at our new Gallery 2 location, which is dedicated to content-driven, experimental and historical exhibitions, this project is the outcome of a rare gathering and communication between these three artists. Crafting significant dialogues and unexpected relationships between historical artists and those of a younger generation is a defining aspect of Andrea Rosen's Gallery 2 program, which seeks to broaden our basis of visual reference and education. The focal point of the exhibition is a shared installation comprising a single yellow wall painting by Olivier Mosset upon which a new painting by Jacob Kassay—the irregular shape of which is defined by the repurposing of canvas scraps from other projects---and Lawrence Weiner's A 36" X 36" removal to the lathing or support wall of plaster or wallboard from a wall (1968), from the collection of the Museum of Modern Art, New York, are hung. On one hand, the installation may be considered as a formalist exercise -- a three-layer relief that, when viewed from afar, appears to be a flattened image. On the other, the combination of the works, in relation to each other and within the gallery setting, inspires new revelations about those works and the relationship between the artists. 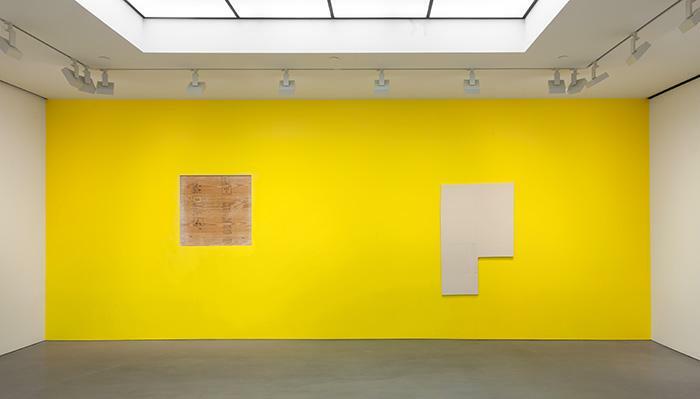 "A yellow wall is a yellow wall, but I like that it is questioned by its situation (the gallery) and the works of other artists whom I respect," remarks Mosset. The exchange between these three artists not only addresses conceptual abstraction and the significance of space; presence and absence; it develops new affiliations between works that reference the hand, material and process. Additional paintings by Jacob Kassay and Olivier Mosset are included in the exhibition. Jacob Kassay was born in 1984 Lewiston, NY. He received his BFA from State University of New York at Buffalo and now lives and works Los Angeles. A solo exhibition of new works by the artist is on view through February 16, 2013 at The Kitchen, New York. Other recent solo shows include Art: Concept, Paris; Protocinema, Istanbul; and The Power Station, Dallas (catalogue). Olivier Mosset was born in 1944 in Bern, Switzerland. He lives and works in Tucson, Arizona and New York, New York. He was a founding member of the BMPT group in Paris in the 1960s, along with Daniel Buren, Michel Parmentier, and Niele Toroni. Mosset has participated in exhibitions spanning the Fifth Biennial of Paris at the Museum of Modern Art in Paris in 1967 to the Whitney Biennial in 2008. Lawrence Weiner was born in 1942 in the Bronx, New York and lives and works in New York and Amsterdam. He is one of the central figures in the formation of conceptual art in the 1960s and has exhibited at the Los Angeles Museum of Contemporary Art (2008); Whitney Museum of American Art (2007); Kunstmuseum Wolfsburg (2000); the Museum Ludwig, Cologne (1995); the Walker Art Center, Minneapolis (1994); the Hirshhorn Museum and Sculpture Garden (1990); and the Smithsonian Institution, Washington, D.C. (1990). He has participated in Documenta V (1972), VI (1977), and VII (1982), as well as the 2005 Venice Biennale, and the Biennale Sao Paolo in 2006. Among his many honors are National Endowment for the Arts Fellowships (1976 and 1983), a Guggenheim Fellowship (1994), Wolfgang Hahn Prize (1995), and a Skowhegan Medal for Painting/Conceptual Art (1999). For press inquiries, please contact Jessica Eckert at j.eckert@rosengallery.com or Michelle Finocchi at michelle@michellefinocchi.com.